Searchcoils generally consist of two internal sets of coiled wires, a Transmit Coil (TX) and a Receive Coil (RX). Mono coils can be different in that one coil acts as both the TX and the RX. 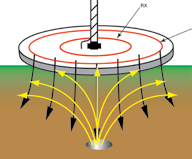 When the detector is turned on, the TX coil generates a magnetic field in the surrounding space. When a metallic object is within this generated magnetic field, it will create a distortion in the magnetic field. The RX coil will sense this distortion and send a signal to the control housing. A searchcoil’s detection pattern is determined by the combination of the TX’s generated field pattern and the RX’s sensing field pattern.